Composting organic matter is just one way to reduce, reuse, and recycle in your Jersey-Friendly Yard. Instead of spending time and money raking, piling, bagging, and disposing of the grass clippings, leaves, and other plant materials in your yard, use them to make a free fertilizer and soil conditioner. 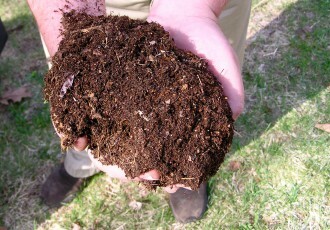 Turn your yard “waste” into “black gold” by composting your plant debris. Compost is a mixture of decayed and decaying organic matter that not only provides a steady, balanced source of nutrients to plants but also builds soil structure. Fungi, bacteria, and other organisms living in healthy soil digest this organic matter, releasing nutrients that can be absorbed by plants. When added to porous sandy soil, compost acts like a sponge, holding moisture during dry weather. In wet clay soils, it improves drainage and aerates the soil, helping to reduce compaction. Use compost as a top dressing or mix it into the top few inches of soil before planting. It also makes great mulch, suppressing weeds and keeping plant roots moist while providing nutrients. To supply organic matter to your lawn, use a mulching mower and leave the grass clippings, which are a valuable source of nitrogen. In fact, grass clippings provide as much as one-half of the nitrogen required for healthy turf grass, reducing the need to apply synthetic fertilizers. Composting is easy. Find out how to get started with these Rutgers fact sheets. There are many ways to compost yard wastes. Composting organic matter is just one way to reduce, reuse, and recycle in your Jersey-Friendly Yard. Reclaiming materials for reuse in your landscape and purchasing materials from local sources are other ways. Steps in manufacturing (including harvesting or extracting raw material, then processing, packaging, storing, and transporting it) use a great deal of energy, produce waste, and often have harmful impacts on the environment and human health. Save money, reduce waste and pollution, and support local businesses by reusing materials and buying local. Reclaim materials like wood, brick, stone, concrete, and metal and repurpose them in your yard. Create compost bins or hanging gardens with wooden pallets. Install a fence or screen using recycled lumber or metal. 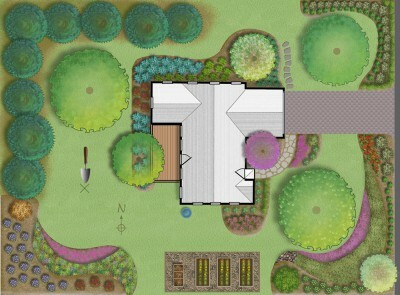 Build a flagstone-like patio or path using broken pieces of concrete, called urbanite. Use an old door as a table, potting bench, or gate. Repurposed items like wheelbarrows, wagons, and bath tubs make unique garden planters. Be creative – the ideas are endless. One way to find local sources of free materials for reuse is through websites like Freecycle. Donate building or landscaping materials to charities, such as Habitat for Humanity, or give them away to other members of your local community using online resources like Freecycle. Bring any unwanted materials to your local recycling center. Choose lumber or other wood products certified as being sustainably harvested by the Forest Stewardship Council (FSC) or a similar independent certifying organization. Avoid buying materials made from polyvinyl chloride (PVC). PVC is commonly used in plastic fencing and decking, irrigation pipes, and garden hoses. PVC releases dioxin, a known carcinogen, during both manufacturing and disposal, and is not recyclable. Some alternatives to PVC are high-density polyethylene (HDPE) for pipes and wood for fencing and decking. 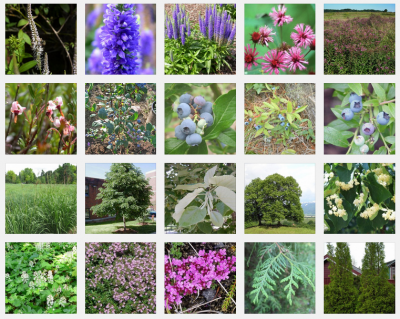 Go to local sources for your landscape materials. Buying local reduces the energy use and shipping costs associated with transportation and supports local businesses.